Return the single character at a specified position in a text input, where 0 is the first position. To get a whole segement rather than a single character, use the Text Segment function. To search for a single character, use Find. position: The location of the character, where 0 is the first position. character: The character at the specified location in the input text. If text is Hello, World! If position is 12 then character is ! Returns the base64 encoding of a string. For example, input “Hello”, would return “SGVsbG8=”. What is base64? text: the word/text that will be converted into base64. output: returns the base64 encoding of the input text. Returns base64 decoded text. For example, the input “SGVsbG8=” would decode to “Hello”. output: returns the decoded version of the text. Combine text you type and fields you drag and drop in. At runtime, all of the text is combined with the values of the fields to generate a single text output. And then you can insert fields from earlier in your FLO that have the appropriate values for name, invoice number, date, and amount. Drag and drop each field to where the cursor is directly over the position in the text where you want to insert the field. The function will generate a single output that, for this example, you can pass directly into the action that sends an email. After fields have been inserted, you can click and drag to move them. To delete a field, click to the right of the field and then use Delete or Backspace. ADVANCED USER TIP: The Compose function is good at “cleaning up” text fields that may be typed incorrectly. For example, if you do a HTTP Get from an API that sometimes returns text and sometimes returns numbers, then that output field can lead to runtime errors in your FLO. If you pass a field into Compose that was incorrectly typed, the Compose function will convert it to text without error. The function has one large input area that accepts a combination of text you type and fields you drag/drop in. Takes the inputs and combines them, without spaces, into a single text output. You can also do this using Compose. The more text you want to combine, the more input fields you can add one at a time. Finds the first instance of a string within another string. To do a more complex search, such as looking for a string that matches a pattern, use the Find Pattern function instead. look in is the text you want to search inside. look for is the text you want to search for. position is the position of the first match, where 0 is the first position. Returns -1 if it is not found. If _look for_ is “T” then position is 0 (first position, where counting starts with 0). If _look for_ is “test” then position is 10 (11th position). If _look for_ is “hello” then position is -1 (no instance found). Find and return the first instance of a valid email address in text. For example, if the input is ”You can reach me at fred@example.com or support@example.com”, the output will be “fred@example.com”. 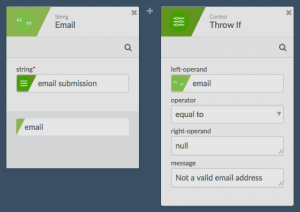 Validate Email Submissions: Used in combination with Return Error If, Continue If, If/Else, or other functions, the Find Email action can be used to validate email field submissions and take appropriate actions. For example, in the below screenshot, if the email submission is not a valid email, an error will be thrown by the Return Error If action. Search for the last match inside text. Returns the position number or -1 if not found. position (number): the position of the last match, where 0 is the first position. Returns -1 if there is no match. Search text for the first match of a pattern. look for is the text you want to search for and/or pattern to match. Patterns must follow a standard pattern format called a regular expression (see details below). position is the position where the first match begins, where 0 denotes the very beginning. Returns -1 if there is no match. For simple searches, Find Pattern works the same as Find. Find Pattern is often used in combination with Text Segment to get the text that matched the pattern. Returns the length of text, in number of characters. Returns the number of the letters/characters in the text. Returns random text of a specified length. length (number): the length of the desired text. output: randomly generated text, of the specified length, composed of both numbers and letters of varying case. e.g. : input length “5” could return “ynt6N”. look in is the full text to start with. look for is the text to search for, or can be a pattern to match using a format called regular expressions. (For more details on search patterns, see Find Pattern. replace with is the text you want to replace it with. all instances - set to True to replace all instances of look for with replace with, or False to replace just the first instance that is found. case sensitive - set to True if the case of look for must be an exact match. If False, then Test would match test, TEST, and tEsT. result text is the resulting text after any replacements are made. If no instances of look for are found, then result text is the same as the input look in you started with. Find and replace any of multiple patterns with a single value. For any find and replace that looks for a single text or pattern, use Replace instead. replace with is the text to replace any instances found, or leave it empty if you want to remove them (i.e. replace them with nothing). all instances - set to True to replace all matches, or False to replace just the first instance that is found. case sensitive - set to True if the case of any pattern must be an exact match. If False, then Test would match test, TEST, and tEsT. patterns - unlike the Replace function that searches for a single text or pattern, patterns allows you to add multiple texts or patterns to search for – all to be replaced with the same replace with text. Add a new input to the patterns section for each additional pattern you want to search. The name of each input is ignored. result text is the resulting text after any replacements are made. If no instances of the _patterns_ are found, then result text is the same as the input look in. You could use this function to strip out a set of characters from a larger look in text. To do this, add fields in the patterns section, one for each string you want to strip out, and leave replacement blank. You could use this function to obscure certain characters in text by replacing them with an asterisk. See Find Pattern for more pattern examples. Split text into a list of text segments separated by commas or other specified delimiter. text: The text that will be split up (e.g. one,two,three). separator: The sequence of one or more characters in the input text that indicator where to break it up. The separator can be a single character like a comma, a sequence of characters like as a comma followed by a space, or even include a line break (just type the “Enter” key while typing a value into the separator input). Tip: If there are spaces in between words separated by a comma such as This, is, an, example, then be sure to include a space after the comma as the separator so the result doesn’t include spaces at the beginning of words. If the spaces are only there sometimes, you can use Trim to get rid of them. Return a portion of text (formerly called “Substring”). text: The text containing the segement you want to extract. start at: The position of the first character you want to extract in ‘text’ where 0 is the first character, 1 is the second, and so on. end before: The position one greater than the last character you want to extract. If left blank or the number is greater than or equal to the length, it will extract all the way to the end. If end before is less than start at, the arguments are swapped. Converts all letters in text to lowercase. output: The text with all letters in lowercase. Converts all letters in text to UPPERCASE. output: The text with all letters in uppercase. This is a test. –> THIS IS A TEST. Remove leading and trailing blank space from text. text: The text you want to remove white space from the start and end, such as Hello, World . output: The text with the space removed. For the above example, would be Hello, World. Returns a random universally unique identifier (UUID), sometimes called a globally unique identified (GUID). It is represented as 32 hexadecimal (base 16) digits displayed in five groups separated by hyphens. Use this when you need to assign a unique ID, such as a tracking number for a transaction. This is the same algorithm we use to assign unique IDs to each FLO execution and to each new row in a table. unique ID: A randomly generated UUID in the format shown above.